Most kids like toys. Mine? She’s all about the nosegay. On Sunday we attended a barbeque at our friends’ house. They have a nice situation–lots of rooms, a gym, big pool, state-of-the-art kitchen, sumptuous garden. We spent most of our time in the latter, enjoying one of the last not-too-hot days of late spring. Dogs ran; adults ate; kids swam. Except for MJ. Declining to join the other children in their canonball run, she instead spent a good portion of the afternoon picking herbs and flowers and stashing them in her pocket. Finally, our ever-attentive host gave her a Zip Loc bag. Into it, MJ poured her mixture of rosemary, mint, jasmine, and other unidentified leaves. Zzzzip. The bag went into her pocket. That night she slept with it. 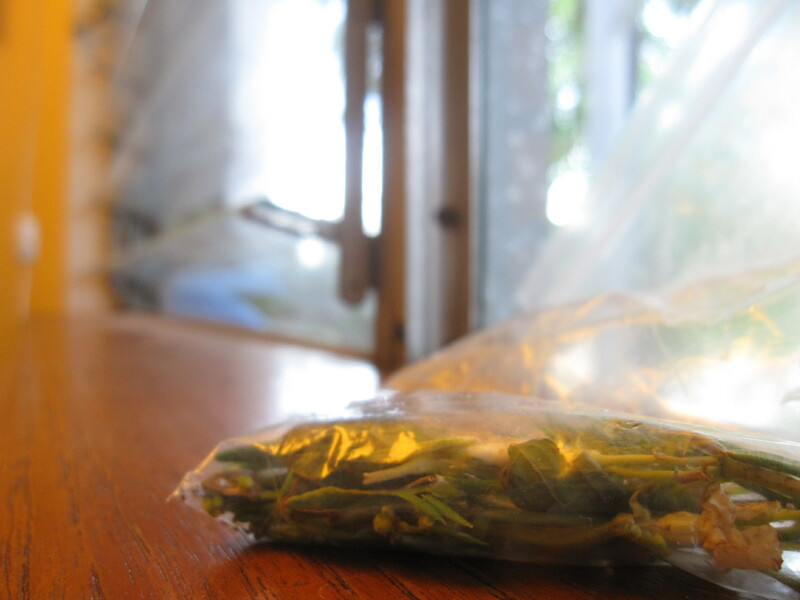 The next day found her concocting “perfume” with herbs from the bag. I have no idea where she heard of this. God knows I don’t wear scents. Quite the contrary: I’m the one who’ll get up and change her seat on the bus if the woman next to me is wearing even a dab of Chanel No.5. While muttering “oughtta be a crime” under my breath. The point is, I certainly never told MJ about perfume. She must’ve picked the whole notion up at school, (along with Disney princesses, yogurt tubes, and “poop breath.” Thanks for that.) And now here she is, making the stuff at home. For hours! When she goes to bed, the bag goes in the icebox for safekeeping. Last night MJ woke up in the middle of the night. She was screaming. My husband ran in. He fell back asleep, eventually. Then a mockingbird got him. Bad night for Mike. Anyway. I don’t know. Maybe it’s the lack of electronics. I’m sure if MJ had an ipad such things would hold little interest for her. As it is? They’re kind of flavor of the month. This entry was posted in childcare, cooking, dog, Garden, Outings and tagged disney princesses, kids playing with herbs, kids waking up at night, mockingbirds singing at night, nosegays, rosemary and mint on May 30, 2013 by thumbstumbler. When I read the title and began reading the beginning of this entry, I started to get concerned. Rosemary’s Baby is my favorite horror movie – bar none. I’ve seen it more times than I can count. So obviously, when MJ began collecting “herbs”, I thought, “If that child makes a little necklace with herbs and says ‘Mommy, I made this for you. It’s tannis root!’, somebody had better call a priest (or at least Roman Polanski).” Luckily, it turned out much differently. I’m just so glad to hear someone else’s kid is carrying around bags of stuff. I even asked the pediatrician about “the bag lady situation” because the boy doesn’t leave the property without a man purse bursting with sub-bags crammed with marbles, legos, unidentifiable metal bits, and a plastic flip phone cover. We do allow some TV so I think it has to be chalked up to general eccentricity. Ah, fantastic. MJ goes to school with a girl who, for the longest time, carried a mail bag stuffed with papers in it everywhere she went. She had, apparently, an overall obsession with office supplies as well. It’s a fabulous part of the pre-schooler brain we don’t hear nearly enough about. Be happy that he uses a bag! When I was a little boy, my mom was subjected to pockets filled with everything from bottle caps and cap gun caps to worms, dirt and frogs (dead AND alive!). Kids will be kids. I know it maybe different from a mother’s perspective, but for me-it makes me feel great that kids are still doing that stuff. I sometimes feel like the new iGeneration is missing out on all those things. Though, now that I’m grown, I do have some sympathy for the moms! Sounds like my grey hair is showing. Time for a touch-up. But I am only mere months (one could say weeks or even days) older than you, so watch it sister!